An Interview with Cindy Alt of the Agape Book Club in Grand Rapids, MI. BookBrowse interviews An Interview with Cindy Alt of the Agape Book Club in Grand Rapids, MI. about all aspects of their book club. Cindy Alt, founder of Agape Plastics, began a book club in her workplace 3 years ago in an effort to balance the physical extra curricular activities that already take place there. The result has been a dynamic group of women - plus one brave man! - who find much meaning in discussing books and learning about each other outside of their usual "work" personas. Please tell us a bit about your book group. Our book club is at Agape Plastics, which is a business that I own. We have over 200 employees – men, women, college students, senior citizens, factory workers and office workers – and we offer 3 shifts. I began the book club about three years ago. We meet once a month, and lunch is provided during an extended lunch period. I buy the books, but anyone in the club can suggest a book. A business-based book club is such a great idea! Are there specific challenges to having this kind of club? My CPA said I could not write this off as an expense. It made no sense to me, because I can sponsor ball teams and golf outings and fishing trips and write them off, but not a book club. He explained that the other teams and events are advertising platforms because the players wear shirts with our company name on it. We took care of it! 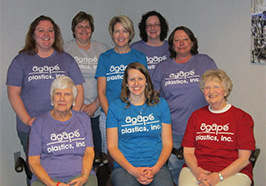 We had shirts made up with Agape Plastics Book Club written on them so that I can write off the book club. All of the book club members were given one and promised to wear them proudly so we could write off our activities too. So far I have not written anything off, but the members think I do, then they don't feel guilty about me buying the books or lunch. They don't need to know that I don't write it off. Do you have book club members from all of the departments at Agape? The meetings are in the conference room. Our theme, which is printed on the back of our shirts, is: What happens in book club, stays in book club. I love that. So you don't have factory workers and you don't have men. Who do you have? - but he dropped out at the end. I'm not sure why. Maybe he felt intimidated; maybe the other guys teased him. Who knows. But at least he gave it a whirl. How many people are at each meeting? There is a core group of about 8 women who are almost always there. The rest come and go as their life or job circumstances change. As I said, we also have friends and family who come from time to time. Would you tell us about your meetings and the sorts of books you read? Because the people are off all different ages, and different backgrounds, we have some very interesting conversations. It seems like books about WWII and the Holocaust are big hits because we get so many varied views, from the people who lived through that time all the way to the college students who are not taught much about it in history class. Another favorite topic seems to be The Civil War era and the slaves. Jodi Picoult is a favorite author, but we try to vary the books we read. They are from different times in history, different genres – some fiction, some biographies, some history, etc – and both male and female writers. What are some of your favorite books? Least favorite? As a whole we seem to especially like books about women where we can discuss their lives and compare. The Sparrow by Mary Doria Russell is the book that no one liked. So let's backtrack a little now. Can you tell me about the genesis of the book club? Why did you want to do it? How did you think of the idea? Agape Plastics participates in many extra curricular activities that are traditionally male-oriented. Fishing trips, ball games golf outings, ball teams, and others like those. But there are lots of women who work at Agape Plastics. Why couldn't we do something that women are interested in? We had a knitting group where we knitted squares, and then sent them away to Warm Up America where they were sewn into blankets. Reading and discussing books was another activity that our women employees were interested in. This is one of the biggest reasons I started the book club. What is the best aspect of the Agape Book Club? I would say the best part of the book club is all of the people from different ages and different backgrounds. It is so interesting to hear everyone's view of the book. I would imagine it’s a unique and refreshing way to hear fellow co-workers' opinions and ideas; an opportunity to get to know them outside of their "work" persona. Yes, the book club has given us a way to know each other better and come to appreciate each other's views. I don't believe many "office politics" are at play at Agape, but if so this group has helped to overcome them.